Lyman Lamartine, a young American Indian man living in North Dakota, remembers his first car, a red convertible Oldsmobile which was unprecedented on his reservation. He used to share it with his brother Henry, but now, he claims, Henry owns the whole car, and Lyman has to walk everywhere he goes. Lyman has always been lucky in that he is good at making money, and he has no problem buying the car when he first sees it with Henry in Winnipeg. The two of them travel all over the Great Plains, even up to Alaska in the car. They meet a girl named Susy with long, flowing hair that almost touches the ground and stay with her family for a season. As soon as they get back home, Henry has to go off to war in Vietnam. He writes occasionally, but Lyman writes many more letters, reassuring him that he is taking good care of the car. Henry is captured by the enemy, but manages to make it home all the same three years later. However, he is vastly changed, affected presumably with PTSD. He is “jumpy and mean,” hardly ever laughing, no longer making jokes, and unable to sit still even though he spends hours in front of their new color TV that often shows clips of the ongoing war. People generally leave him alone because he has become so strange, and, in one instance, he even bites through his lip, but lets the blood drip as if he doesn’t even notice. Lyman and their mother consider taking him to a doctor, but the only doctor nearby used to court their mother, and they fear her rejection of the doctor would lead him to mistreat Henry. They refuse to take him to a hospital for fear that he will never return, or that he will be given drugs instead of proper treatment. Lyman resolves to find another way to help Henry, so he smashes up the convertible in the hopes that Henry will take an interest in something again. For a while, it seems to work—Henry fixes the car successfully, and, for months, it gives him something to do. He seems somewhat calmer, though he is still quiet. One day, after the car is fixed, Henry suggests they take it for a ride. Before they go, their eleven-year-old sister Bonita takes a picture of them with the car. Lyman will keep that photograph on the wall until it becomes too troubling and he hides it in a closet. That evening, they drive out to the Red River because Henry wants to see the high water. At the waterside, Henry reveals that he knew what Lyman was doing when he intentionally destroyed the car, and that he wants Lyman to have the car all to himself. Lyman refuses and they playfully argue, until it turns into roughhousing. They drink several beers and talk about leaving, maybe picking up some girls. Henry is quiet and withdrawn again, and says that the girls they know are crazy. Lyman, trying to keep the mood light, tells him he is crazy. For a moment, it looks like this will upset Henry, but instead he jokes back, saying that Indians are all crazy. They rile each other up all over again, and suddenly Henry jumps in the river, saying, “Got to cool me off!” But he is taken under by the strong current—the last words he says are “My boots are filling.” Lyman jumps in after him, but he cannot save him, and it is unclear what Henry’s intentions were in going to the river and jumping in: if it was an accident, or suicide. Lyman emerges from the river and pushes the car into the river. Feinman-Riordan, Grace. "The Red Convertible Plot Summary." LitCharts. LitCharts LLC, 31 Aug 2018. Web. 11 Dec 2018. Feinman-Riordan, Grace. 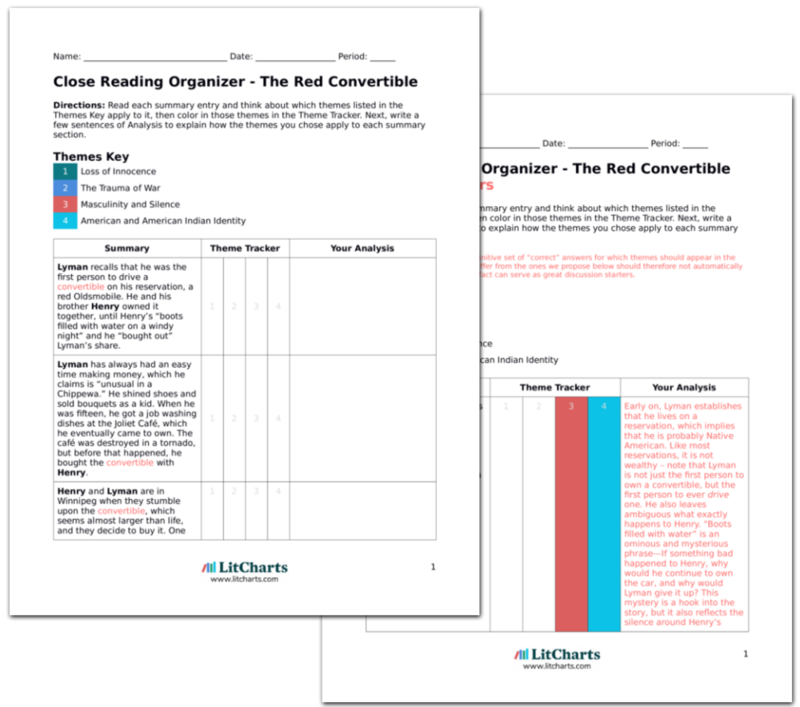 "The Red Convertible Plot Summary." LitCharts LLC, August 31, 2018. 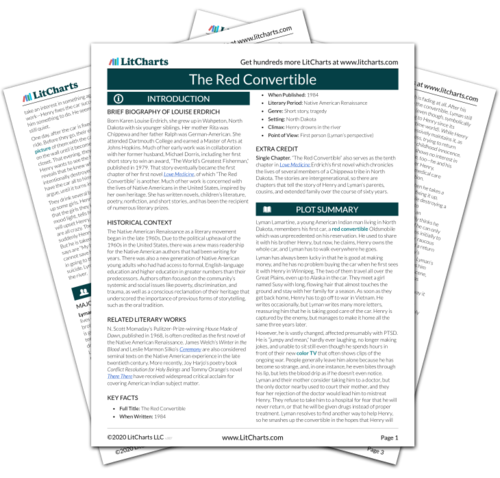 Retrieved December 11, 2018. https://www.litcharts.com/lit/the-red-convertible/summary.